FREE PATTERN and an FO BABY! I think it's the bee's knees. The pattern is available for free from the folks at Tahki Stacy Charles. I imagine wearing this with the summer dresses that I claim I'm going to sew for myself. We'll see. Things haven't been getting made as quickly as planned 'round these parts. Take these socks, for instance. Yarn: From YarnPirate.com, "I want candy" colorway. 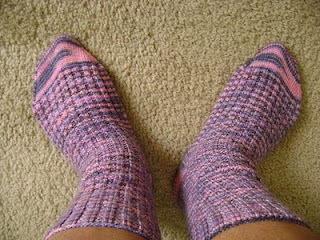 I first blogged about starting them back in June of 2009. Poor things. They got pushed aside so that I could start other projects to neglect for years work on other projects. I pulled them out of a bag about a month (two months?) ago and was determined to finish them. Now that they're done and I've already worn them at least 3 times, I'm sort of mad at myself for taking so long to finish them. Because I have fallen in love. I like to run my toes along the purl ridges on the inside of the sock. I don't know why I told you that, but I thought I'd share. Believe me, this is nowhere near the little tidbits of "TMI" my friends are used to hearing from me.